Contains no silicones which may affect your furniture's finish. Accept no imitations.Silicones may seep into your furniture's finish and create a hazy film (referred to as blooming). 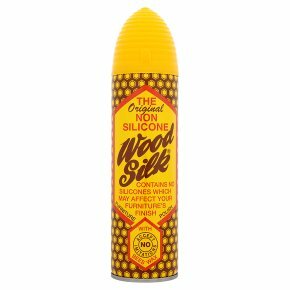 Non Silicone Wood Silk furniture polish does not contain silicones. Non Silicone Wood Silk is a blend of the purest Beeswax and nutrient oils. It superbly highlights the original grain/colour of wood and replaces the natural oils lost by direct heat and central heating. It's the natural way to care for your furniture. Non Silicone Wood Silk is for use on gloss satin and matt wood finishes. It is ideal for Solid Wood/Reproduction Furniture, Natural Interior Doors/panelling, Wooden Block Floors. Do not use on unsealed wooden surfaces (including scratches, particularly on lighter coloured furniture). Directions 1. Shake well. 2. Hold container as upright as possible 6 inches from surface to be polished. Spray sparingly and evenly. 3. Buff immediately with a soft clean cloth. 4. When the finish is unknown or old, first test on an inconspicuous area. 5. For small or hard to get at areas, spray on cloth and polish.